There’s some serious hotness going on outside, escape it at one of the many swimming holes around Austin: Blue Hole. 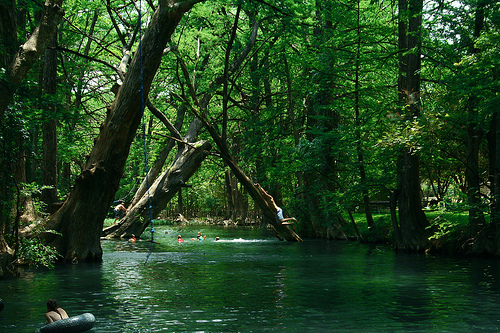 If you are looking for that perfect natural spot to get your your toes wet and are over your neighborhood pool, strap your seat belts on and head to Blue Hole. 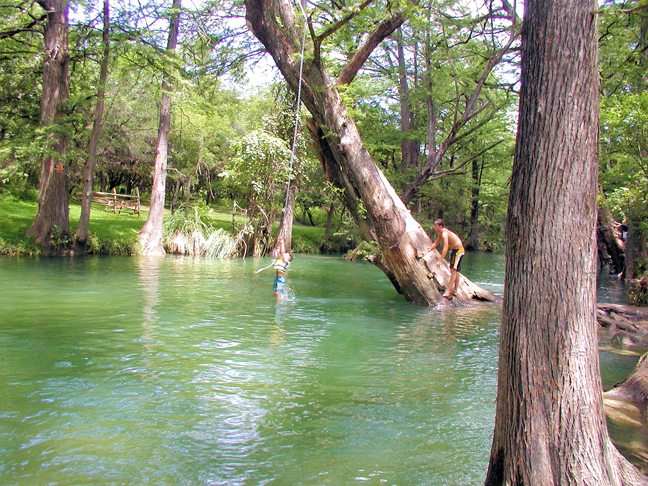 Blue Hole is a natural swimming hole just 40 minutes south of Austin outside of Wimberley, Texas. The space is gorgeous. You will drive into what is 126 acres of natural forests and grass fields. The land has been preserved by many volunteers, and its old cypress trees and wildflower grasses provide homes for native birds, insects, amphibians and mammals. What you will notice is a natural space with plenty of parking and paths that wind around and lead you to the entrance quite easily. Parking is free, but there is an admission price for entrance into the park that gets you in all day. They also provide a season pass price if you love it that much! On Memorial Day, July 4, and Labor Day, the hours of operation are from 10 a.m. to 8 p.m.
You definitely want to bring chairs, blankets, toys, floaties, and food. The water hole has areas appropriate for younger kids where they can step in and either doddle around, or float and easily touch the ground. 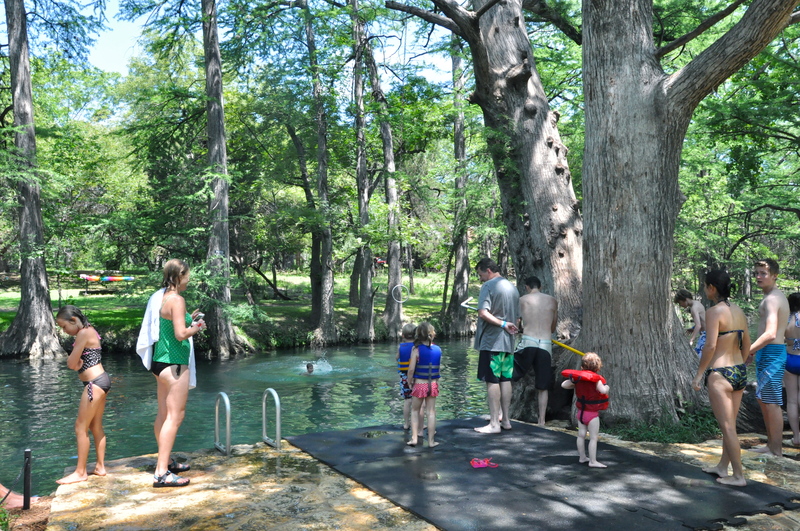 But the hole gets deeper and has two rope swings for older kids and parents who want to jump in! The water is chilly, but refreshing and if you don’t like squishy lake bottoms, I’d throw on a pair of keens or water shoes. if you aren’t into jumping, it is perfect to hug a large water noodle or floatie and enjoy the shade and atmosphere. The area outside of the watering hole is just as cool. There is a grassy expanse that lines the waters edge that you can use a base for your posse. This is where you will set up blankets and chairs. Its large enough that people bring footballs and Frisbees to pass. Once you get there, you so get into the chillaxing vibe you will be there for hours, so don’t forget food. Remember you are in the Texas ‘wild’ and there is not a food truck or barbecue unless you decide to drive there on your way home. So bring food and drinks!! Aren’t you ready to check it out? A little word of caution: kids 13 and under will not be admitted without and adult and dogs are not allowed. This not a lifeguarded swim area. Good news: there are public restrooms a short walk away from where the entrance/pay area is. written by Jennifer Wizbowski, a freelance writer, mom of two and explorer of new things.